This is a political advertisement ran in the Southern Illinoisian paper on March 14, 1976. The literature pertains to the 1976 Illinois Governor Election and Democratic Primary in which the ad supports Democrat Michael Howlett for governor. It was a privately funded ad paid by Sangamon County Friends of Michael Howlett and Charles Robbins. Howlett went onto get the nomination over his opponent the incumbent Dan Walker, but Howlett lost to the Republican Jim Thompson. The Southern Illinoisian is based out of Carbondale reporting on local matters, not just political. In 2013, it changed over to The Southern, and has grown in influence and readership, being used by many graduate students today for scholarly research. It continues to focus on current issues including a recent controversy on excessive police force in Metropolis, Illinois. This particular advertisement is a counter ad to the run in the previous page by Dan Walker, funded by Southern Illinois Voters and Tony Ison of Mt. Vernon. The entire page is dedicated to Howlett, and Robbins uses the forum to highlight how Governor Walker once elected had brought in mostly out of state people to fill positions within the administration. In all twenty-seven names and positions were listed in the grievance inside this ad including James Trainer, Director of Public Aid, Ed Bishop, Department of Business and Economic Development, and David Fogel, Executive Director of Illinois Law Enforcement Commission. 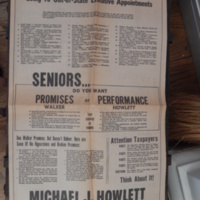 Charles Robbins and Southern Illinoisian Paper, “Michael Howlett Campaign Ad for Governor's Election in 1976,” UIS History Harvest, accessed April 22, 2019, http://uishistharv1.uis.edu/items/show/220.